Back in November, I was invited along to a local beauty salon in the North East called Refine Spa in Whitburn Village, Sunderland. I’d been to Refine many times in the past for treatments and those of you who are long time readers of WhatLauraLoves may remember my blog post and video all about the HD Brows treatment that I had there. To this day, it is one of my most viewed posts and my video with the highest amount of views on it but I guess that’s because back when I had them done, the treatment had only just come out in the UK. That’s the great thing about Refine Spa, they’re always well ahead of the game and bring the best in beauty direct to the North East. I’d highly recommend the pumpkin peel if your skin is feeling particularly clogged. I had this treatment a few months ago and my skin is still feeling the benefits of it now. There’s also a boutique within Refine Spa called Tigerlily which stocks the most beautiful clothing that goes right up to a size 32. I’d always thought that their stock would have been for those ladies who are much smaller than I am but on a recent trip, I discovered that they sell plus size pieces too. 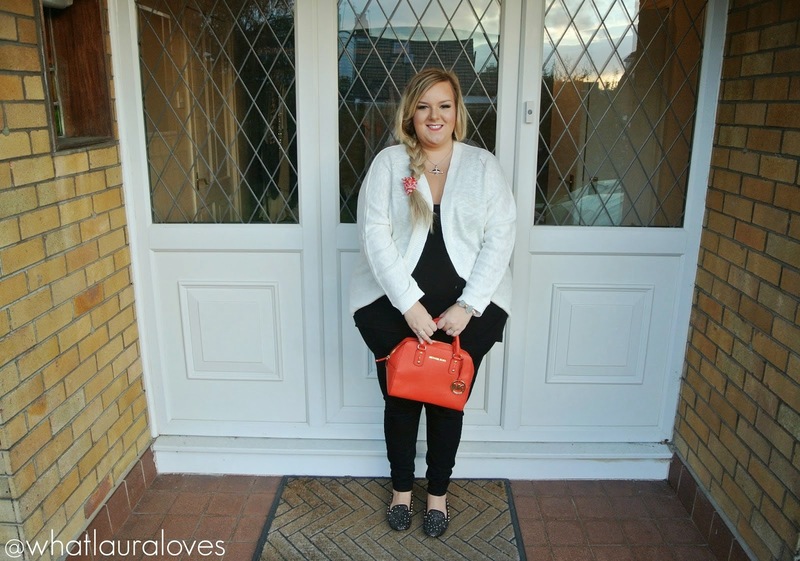 The beautiful grey jumper with chain necklace detailing that I’m wearing in the above photo is actually from their and I couldn’t recommend it enough. The quality is simply outstanding. With already being a customer of Refine and loving their work and products, I’m sure you can see how much of an easy choice it was for me to say yes when they asked if I’d like to come along to try out their new, own brand of hair extensions. 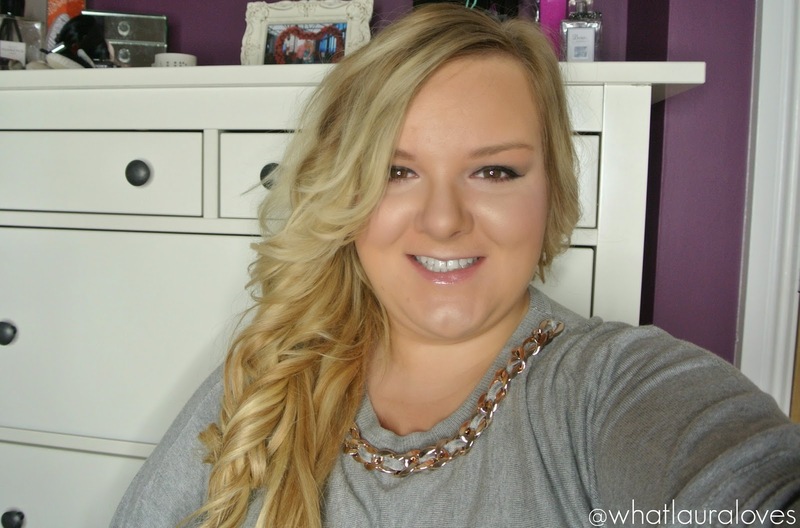 Sinead, who fitted my extensions for me, hasn’t asked me to write a review about her extensions, simply to try them out and give her feedback but I wanted to share my thoughts with you all too because I think they’re a really good choice for girls looking at getting hair extensions for the first time. Refine Spa fit three different types of hair extensions. Firstly there’s Easilocks which are the premium brand that they offer, then there’s Angelslocks which are their mid price range extensions and then S Locks which are their brand new own brand of hair extensions, named after their creator, Sinead. The unique thing about all of these extensions brands is that they don’t require any heat to apply them to your hair which means that they don’t cause any damage, especially during the application, whatsoever. Making an appointment at Refine is quick and easy, everyone that you speak to when you phone up is so friendly and I found that while they’re a salon that offer the best of the best, they are very approachable and not pretentious in the slightest. If you have any worries whatsoever, they’re so easy to talk to and are more than happy to answer any multitude of questions that you may have. The salon is so easy to find as it is literally on the main road as you drive through Whitburn Village with ample parking in their own carpark behind the salon. 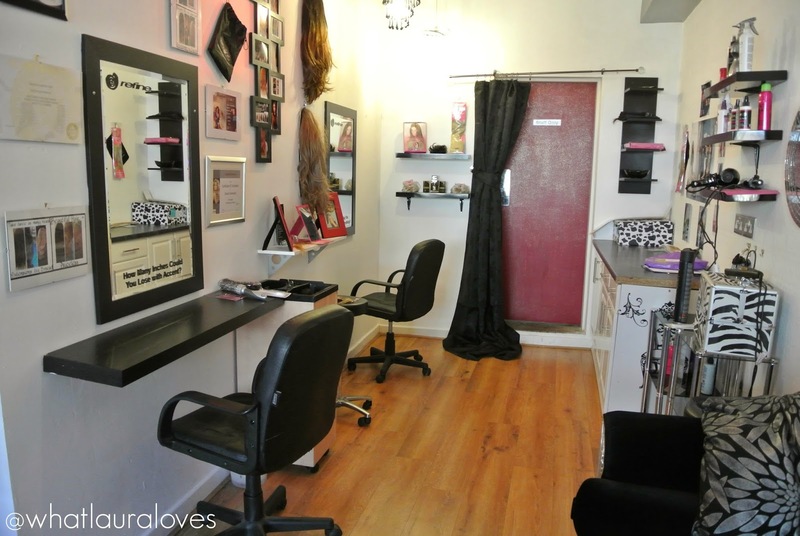 Inside, the beauty salon is well laid out with an area dedicated exclusively to Sinead’s Hair Extensions. Everything is spacious and comfortable and the environment is really relaxing which is very important when you’re going to be sitting for a while having your extensions fitted as it does take a couple of hours or so. I read up about Sinead before going along to the salon and I knew instantly that I was going to be in safe hands as she was trained and accredited by the best of the best, Easilocks founder Shane O’Sullivan before Easilocks even hit the big time. This really put me at ease as I knew that I was going to be seeing someone who was really skilled in the art of fitting hair extensions. 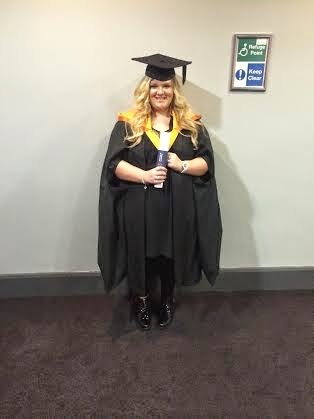 Sinead is also an educator and trains others in fitting hair extensions so I knew that not only could she talk the talk but that she could walk the walk as well as others put their trust in her to train them to their best potential to benefit their own business ventures. When having the extensions fitted by Sinead, she will book you a consultation appointment first of all where she will go through the different options for extensions with you and the costs as well as colour match you so that she can have the exact colours in stock ready to fit your extensions when you come in to have your fitting. This bespoke service means that you can get the right colour and tones to suit your own hair and you’re able to have more than one shade in your hair so that rather than having a flat colour, you gain a multi-tonal effect. If you’re looking to add colour to your own hair without dying it then this can also be achieved with the extensions alone by adding different shades of colour throughout the hair, mixed in with extensions that suit your hair colour already. This will enable you to preserve your hair and give you the option to change the extra colour more often without committing to a dye job at the hairdressers. The S Locks extensions, or any of the other extensions that Sinead fits, are available to add length to the hair, or thickness or indeed both. Not everyone wants long hair but many want thicker hair so they can be applied and cut to suit the length that you want but giving you the thickness you desire. Some girls already have beautifully long hair but it is fine and thin, adding these extensions can give them the volume that they’ve always wanted without damaging their natural hair that they’ve grown for so long. There’s some fabulous before and after photographs over on Sinead’s Hair Extensions Facebook page that you can have a look through to see some of the transformations. As you can see, before having my hair extensions fitted, my hair was looking very fine and thin. I’ve always had fine hair and wished that I’d had thicker hair to give me some more volume. 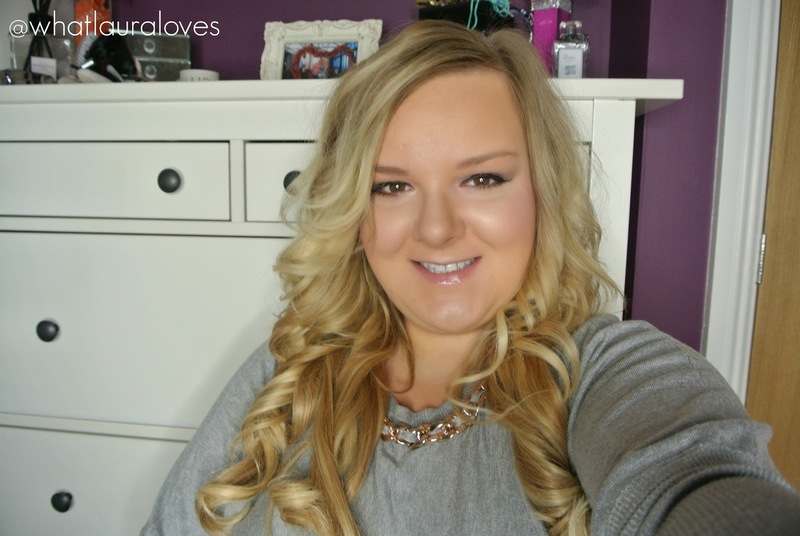 Just before having my extensions fitted, I had had my roots died a darker, golden blonde and pulled through the lengths of my hair to darken it down quite a lot. You may have noticed how dark it is compared to photos from earlier in the summer. My reason for wanting to go a little darker was to help the condition of my hair and because I’d always fancied seeing what I would look like with darker blonde hair given that I’ve been very fair for my whole life! Over the last couple of years, I’ve done A LOT of travelling and as my hair naturally lightens in the sun anyway, the increase of my exposure to the sun had caused my hair to lighten dramatically so when my already pretty light roots were coming through, they looked really dark as the rest of my hair was lily white! Definitely time for a break and I found that the combination of having my hair dyed darker and having the extensions in, really gave my hair the opportunity to just be left to grow and replenish itself. Sinead selected three different shades of blonde to add to my hair and applied these to my hair in a very natural way, so that the lighter pieces would catch the light and the darker pieces would add depth. 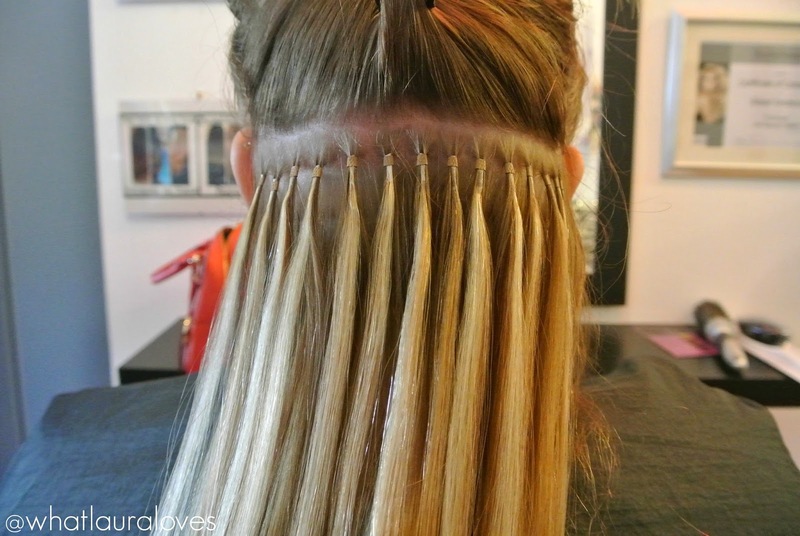 The photo above shows a row of the extensions as she had applied them to my hair. As you can see, they’re all evenly spaced with no stray hairs left in between the bonds. That’s the sign of a good hair extentionist and as I’m no stranger to having hair extensions fitted, I know someone who is good at applying them when I see them! It is so important to keep the application of the hair even and to ensure that there’s no hair left in between so that they don’t matte together. You might notice that the bonds look different to the hair extensions that I’ve had fitted in the past and thats because these have a mini lock rather than a glue or keratin bond so they are the most gentle form of extensions that you can get as they do not cause any damage to the hair during application. S Locks extensions are made with the finest quality Russian human hair and they are applied using a no heat and no glue method. The hair is bonded together itself during its manufacturing and when it is applied to your hair, a mini lock, or micro ring as you may have also heard them referred to as, is used to seal a small section of your natural hair and the pre bonded extension in place. This is a very quick and easy method of application and doesn’t cause any pain or tugging whatsoever. The whole experience of having the S Locks fitted was actually very relaxing and an enjoyable experience, certainly much quicker than any other extensions that I’ve had in the past. I couldn’t believe how quickly my hair had been transformed from short, thin and lifeless to voluminous, long and luscious! The speed at which these could be fitted was really important to me as I have a bad neck after an injury almost two years ago. I find sitting for long periods of time to be very awkward and painful for me so that fact that I didn’t have to sit for very long to have the S Locks fitted and could have breaks in between where I could get up and move around, was a huge benefit to me. The S Locks hair is approximately 20-21 inches long with a little room for cutting and after application, Sinead is more than happy to cut into them to shape them as you would like. This is really important as the shaping of the extensions helps them to blend in with your own natural hair. I opted for a couple of light layers and some gentle feathering around the face so that they would blend in seamlessly with my own natural hair which is considerably shorter than the S Locks and I really think that they did blend in well. Over on my youtube channel, I have a could of videos here and here where I have my S Locks extensions in and you can see how natural they look and the way that they move and blend with my own hair. I am SO impressed with them. The application through to the way that they looked was so spot on, especially the colour match to my hair. 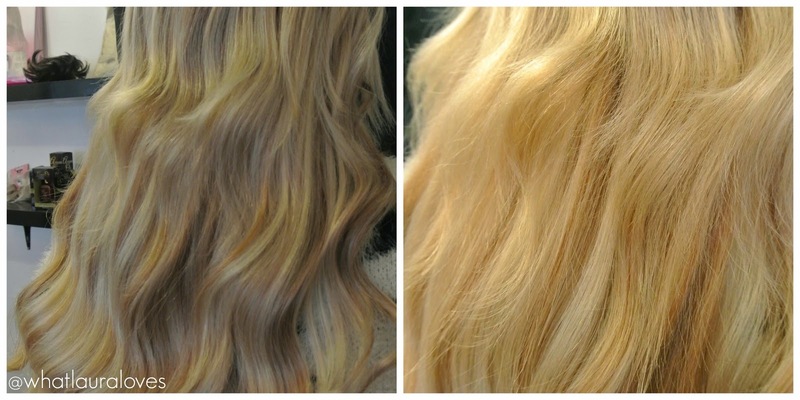 Very natural and full of lots of gorgeous blonde tones. After having my extensions fitted, my roots were in need of a little dry shampoo in them despite my hair being freshly washed that day. That’s because when you have hair extensions fitted, your hair is being touched much more than it usually would and the natural oils from the hands can transfer onto the hair and if you have oily hair to begin with, it can look a little more shiny than usual. This is always to be expected with hair extensions when first having them fitted. The extensions were so easy to style and curl myself. This was when I had first curled it and day by day the curls would drop a little more so my hair would look longer as the days went on. As soon as the S Locks were applied to my hair I knew that I instantly loved them as they added just the right amount of natural thickness to my hair as well as plenty of length. They blended in seamlessly and felt so lightweight in my hair. They didn’t feel as though they were weighing my hair down or that the bonds were too tight or nipping at my root, they were incredibly comfortable and that is something that I also found at night too. Usually when you have hair extensions fitted, they feel a little strange at first when sleeping on them, but not these ones. They were very comfortable from the word go and I very much think that that is down to the mini lock/micro ring bond that they are fitted with as they are so incredibly small and discreet and flatten to virtually nothing in your hair. This also meant that when tying my hair up, they were virtually undetectable in my hair which was handy for me as I also like to wear my hair up in a pony tail or in a high bun when I am in a rush to get out of the door on a morning. When fitting my extensions, Sinead was very thorough and asked me about the ways that I styled my hair so that she could make sure that she left enough of a gap either side of my head and underneath so that the extensions wouldn’t show when I tied them up. This, coupled with the fact that the bonds are so flat and small, meant that they couldn’t be seen in my hair. So many of my friends that hadn’t seen me for a while actually thought that my hair had just grown as they looked that natural and undetectable in my hair. After having my gorgeous S Locks fitted, Sinead was more than happy to give them a curl for me and styled them into a loose wave for me which looked so pretty and ensured that I left Refine Spa feeling like a princess. Before leaving Refine, Sinead made sure to explain the aftercare of the extensions thoroughly to me and recommended products to use that would be suitable for the extensions so as not to damage the hair or the bonds. 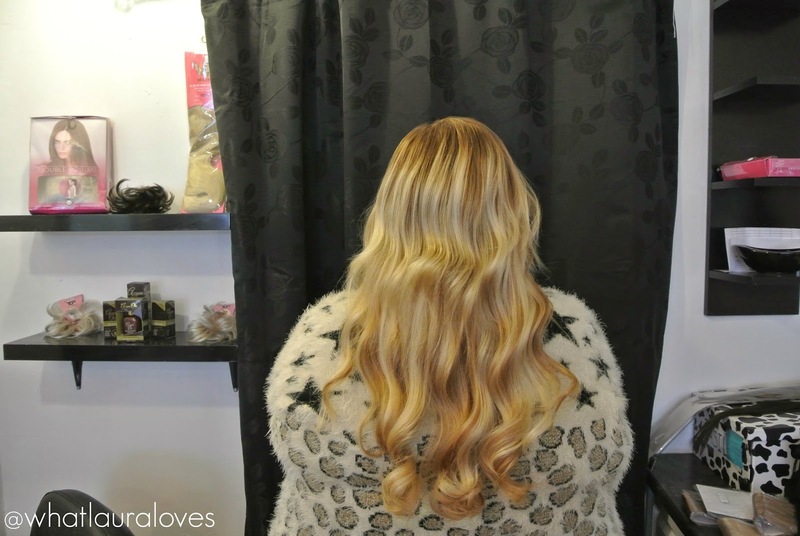 I really liked this service as Sinead knew that I had previously worn hair extensions for years and could have easily glossed over what to do but she didn’t and made sure that she went through everything thoroughly with me. The great thing about S Locks extensions, and the other extensions that Sinead fits, is that the hair is completely reusable for about 6 to 9 months depending on how well you care for it. When looking on the Facebook Page you can see so many hair extension refits and the hair looks as beautiful and thick as it did when they were first applied. Sinead recommends having the hair extensions refitted every ten to twelve weeks, because the extensions will move further down the hair as your natural hair grows, and her charges for this are very reasonable. You have a couple of different options when having your extensions refitted. Since they do not cause any damage to your natural hair, you can either have them taken out and refitted on the same day, or if you want to you can have them taken out and then go to have your hair colour topped up at your usual salon and come back another day to have the extensions put back into the hair. Something to keep in mind with micro ring style extensions is that while they are very sturdy in the hair, they are not the most durable form of hair extensions because they are so gently applied without any heat to physically glue them to the hair. This isn’t usually an issue for those with dry hair but for those with greasy hair like mine, it is something to be mindful of as you may notice that they will slip down the hair a little quicker than heat bonded extensions would because of the natural oils in your hair. Refreshing your hair with a light spray of dry shampoo can help to prolong the longevity of the extensions as it helps to soak up the excess oils. Pulling my S Locks extensions around to the side of my head with a messy side plait. I’m very pleased to say that I experienced very few of the S Locks extensions slipping completely out of my hair in the weeks following the application and they were so easy to take care of. They were easy to wash, condition and style, they held a curl very well and I could easily go three to four days without washing my hair and just spritzing my roots with dry shampoo. While I may have had a couple of the extensions slip out, I didn’t mind this at all because I could see that none of my natural hair had broken off and that no damage had been caused to my hair. Plus as I had a full head of extensions fitted in my hair, losing the odd one or two really doesn’t make a difference and no one can tell as there are no sparse areas or gaps. What I loved the most about them was that not one of the bonds became knotted or matted with another. They were incredibly easy to manage and so soft, I never had to worry about knots or tangles in my hair. About a month and a half into having my hair extensions fitted, I signed up to a new health club and started going to aqua fit and swimming on a regular basis and it was at this point that I did begin to have some issues with my extensions. Rocking my uber trendy Christmas Jumper with my S Locks in. I loved pulling sections back and pinning them! Up until this point, I had had no issues whatsoever with my hair extensions. The S Locks were so easy to style, they washed incredibly well and they looked and felt fantastic, so natural and lightweight and absolutely perfect for me! However when I started to introduce swimming into my routine, I found that the chlorine didn’t react very well with the extensions and seemed to strip them of moisture. It didn’t matter what products or treatments I used on my hair, nothing could pull them back and I found that I would wash, condition, treat and style them and they would look perfect but within hours the mid lengths and ends would become very dry and sort of bunch up together. I was always on top of this by taking my Denman Tangle Tamer (review in this post/ buy it here) out with me to brush through the hair to stop the bunching together from becoming matted. During this time, I found that I started to lose more of the hair extensions and they seemed to shed more. Hair extensions do shed naturally, especially as your own hair is constantly growing but this was more so than usual. Eventually, I took them out towards the end of the second month of having them in as I didn’t want the excess brushing to cause any damage and I figured that I’d be due a refit in a couple of weeks anyway. I wasn’t upset about this in the slightest as I had had almost two months of beautiful quality extensions in my hair with no damage to my natural hair whatsoever when they were removed. My hair looked so healthy after I had them taken out, none of the strands had snapped or become brittle and I was really impressed at how the S Locks Extensions had literally not damaged my hair in the slightest. 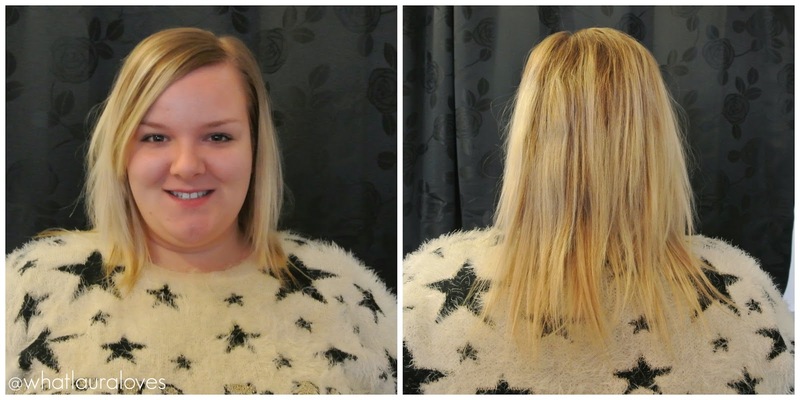 I removed the hair extensions myself which was incredibly easy to do however Sinead does offer a service where she can take them out for you and refit them if you would like them to be put back in again which in all honesty, I would recommend to everyone. Taking the extensions out yourself is easy if you’re used to it but it takes far longer than having them removed in the salon and it really makes your arms ache after only a short while! Plus, I’d much rather be sat in the friendly environment of Refine Spa than at home removing them! Even when my hair was pulled back into a tight bun, my extensions couldn’t be seen! Now I know that taking them out may seem like a negative but honestly, don’t let that put you off. Sinead had made me aware that the extensions can dry out because of the chlorine in the water and it was my own choice to join the fitness club and attend the swimming classes. I needed to for my own health and to try to rehabilitate myself after an accident. However what I will say is that this is certainly not the only brand of extensions that this has happened with. The year before I had Cinderella Hair Extensions applied in a bid to save me some money against my usual Great Lengths Extensions and although those are Indian Remy Hair and these are Russian Hair, they felt very very similar in my hair. The Cinderella extensions are bonded with keratin and then applied using heat to attach them to the hair which isn’t as gentle a method as the S Locks. When first applied, they had a similar shiny coating on the hair to the S Locks which I think is due to the manufacturing process. Like with the S Locks, this slightly unnatural shine went away after the first wash which takes place two to three days after first having the extensions applied. The bonds of the Cinderella Extensions were far larger than the S Locks and I found that when I went into the pool on holiday, the hair behaved in EXACTLY the same way as the S Locks did by drying out and becoming difficult to manage, resulting in me having to take them out after only a month of wear. I was absolutely gutted at the time as although they were cheaper than my usual Great Lengths, the Cinderella Hair was very expensive, much more so than the S Locks Extensions that I had fitted by Sinead. This had never happened with my Great Lengths Extensions and I always presumed it was because the Great Lengths were a superior quality of hair compared to the Cinderella. When the same thing happened with the S Locks, I decided to consult Sinead as she really knows her stuff when it comes to extensions and she was so lovely about it. She recommended that those who do a lot of swimming should opt for more of the premium hair extension brands that she fits such as Easilocks, or Angelslocks if the Easilocks are out of your price range, because they’re able to cope better with the chlorine in the water. I feel very confident in taking her advice with this and if I were to get extensions again in the future while I am still going to the aqua classes then I would definitely upgrade to the Angelslocks or the Easilocks. However if I were able to find a class that I could comfortably attend that didn’t involve water, I would happily have the S Locks hair extensions back in my hair and although I would need to purchase a new set of the extensions as the others were too damaged by the chlorine, this wouldn’t be a hardship for me as the extensions are so incredibly affordable to begin with and a new set would be well worth it for me. If you’re someone who is looking for an affordable way to add excellent quality, natural looking volume and length to your hair with extensions then I would absolutely, 100% recommend S Locks Hair Extensions to you. If you’re someone who goes swimming then I would recommend taking Sinead’s advice and opting for one of the other mini lock style extensions that she offers so that you can get the full use out of the hair and have it refitted for months but also keep in mind that what happened to me may not happen to you. I can only give an honest report on how I found the hair extensions. While I had the S Locks Extensions in my hair, I was on cloud nine. They looked and felt amazing and they were so easy to manage that I knew it wouldn’t be the first time I would get these extensions in my hair. I knew throughout my time with them in that they weren’t damaging my hair in the slightest because I could feel a stark difference with them compared to other extensions that I’ve had in the past, including clip in extensions which tend to have a razor effect on my hair and the weight of them makes it snap off if I wear them too frequently. For someone who has such fine, thin hair, I have to be really really careful so as not to use hair extensions that are going to cause it any damage as it is already fragile and the S Locks extensions were absolutely perfect for me. I am already planning to get a new set put in sometime later in the year when I know that I have a few months break from going on holiday so that they wont dry out in the pool. I am working on my fitness and rehabilitation now so hopefully I’ll be able to do some work in the gym rather than relying on swimming and when that time comes and I’m not in the pool every week, I’ll be getting my S Locks fitted again. I absolutely LOVE them and don’t see the need to pay any more for extensions when these look fabulous and are very affordable as far as fitted hair extensions go. I can’t wait to have them put back in and it might be sooner than I have planned as I’m not sure I’ll be able to resist them for much longer! Refine Spa is open Tuesday through to Saturday with hair extensions available to be fitted every day except a Friday where Sinead works exclusively out of Sophie from Geordie Shore’s salon above her boutique, Off The Rails, in South Shields. I haven’t visited that beauty room before so I wouldn’t be able to pass judgement or recommend it but what I can recommend is Sinead’s skills as a hair extensions technician and the Refine Spa itself which has always been outstanding. Sinead can also work on a mobile basis if you are unable to get to Refine yourself. There’s lots of ways to get in touch with Sinead. She has a Twitter page here and a Facebook page here and there is a Facebook page for the Refine Spa and Tigerlily Boutique too here. I find that the Facebook pages are the best way to keep up to date with all of the latest offers available at Refine Spa and there’s some great deals on across the range of hair extensions right now! If you’d like to book in with her for a free consultation, either drop her a message on one of the social media platforms or call Refine to book on 0191 529 2199. Refine is located on 14-16 East Street, Whitburn Village, Sunderland, SR6 7BX. What is your favourite look to create with long, luscious hair? Don’t forget to enter my current giveaway with UK Tights here where you could win three pairs of Charnos socks. 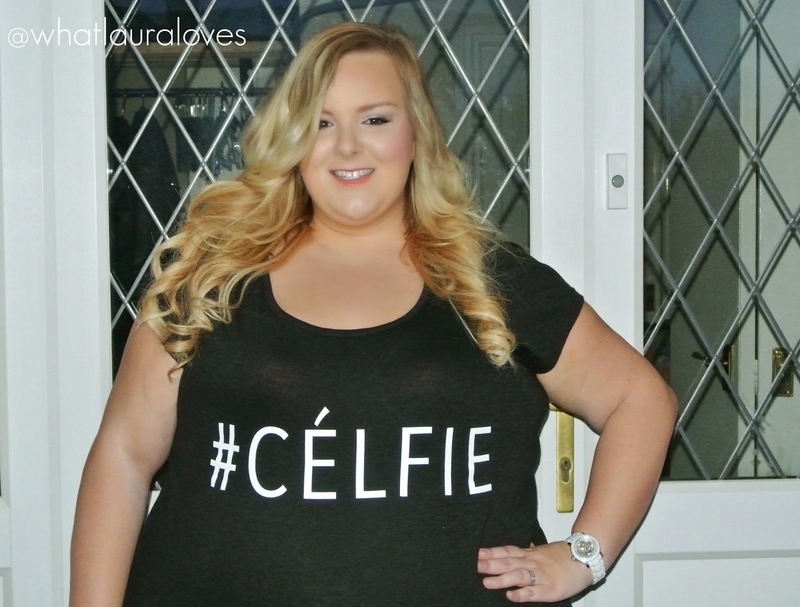 Wow, your hair extensions look amazing! And really natural, too. I wouldn't have known you were wearing them! I'm pretty low-maintenance with my hair, but sometimes I like to use a sea salt spray to amp up the volume and get some waves! That's probably one of the most thorough and in-depth reviews I've ever read. I really don't know much about extensions as I have pretty long hair myself but it's an interesting idea that it can thicken so I might look into that in the future. Great post! My hair has been getting thinner due to hormones. This looks like an excellent option. My hair used to be so thick too! Very frustrating. I'm really impressed that you can't see them when you have your hair in a bun! They look so natural on you, if you hadn't said they were extensions, from the photo, I would never have known. I do not use them but your extensions look great! You look sooo beautiful with long hair. I love long hair and I keep it long all the time. I think it's because when I was little my mom must have been fed up with managing my long hair so she chopped it all up boy style and I remember crying all the time about looking like a boy. Well no more because this long hair isn't going anywhere! I have been wanting to try hair extensions for a while now and not sure where to begin. You've inspired me to take the leap. They look ah-mazing! On another note, there is a reply for you on my Stella and Dot post from my Stylist there. http://www.yummomummo.blogspot.com.